Cat lovers, rejoice! 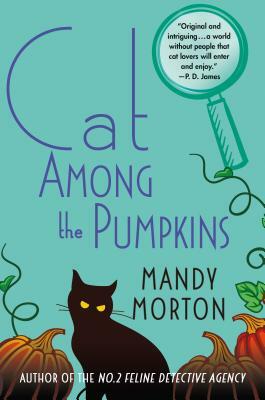 The second installment in Mandy Morton's cat-driven series has arrived with Cat Among the Pumpkins, where crime-solving is in the capable paws of felines. And these cats haven't been declawed. As All Hallows’ Eve approaches, Hettie Bagshot of The No. 2 Feline Detective Agency has more than just a ghost and warlock tart on her plate. Along with her faithful sidekick, Tilly, the tabby duo set out to investigate an old crime and a spate of new murders. Why is Mavis Spitforce dressed as a pumpkin? Can Irene Peggledrip really talk to cats from the spirit world? Did Milky Myers murder his family on Halloween, longer ago than anyone can remember? All questions the pair must answer before the case can be solved. As the November fog closes in, where will the killer strike next—and will there be enough catnip to go around? MANDY MORTON began her professional life as a musician. More recently, she has worked as a freelance arts journalist for national and local radio. The No. 2 Feline Detective Agency series was inspired by her own cats, Hettie and Tilly.